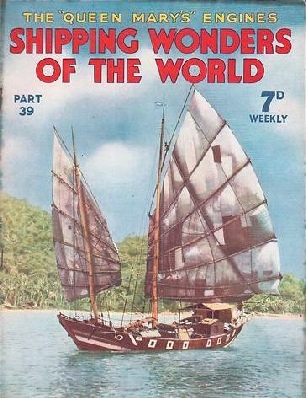 Part 39 of Shipping Wonders of the World was published on Tuesday 3rd November 1936. This issue included a colour plate illustrating the RMS Queen Mary. It formed part of the article on The Queen Mary’s Engines. The plate was attached to page 1229 of part 39. This week’s cover shows a typical Chinese junk sailing past the island of Pangkor, Dindings, Straits Settlements. Some of these junks are used for carrying petrol on a coastal service, and contrast strangely with the oil-tankers of the western world. 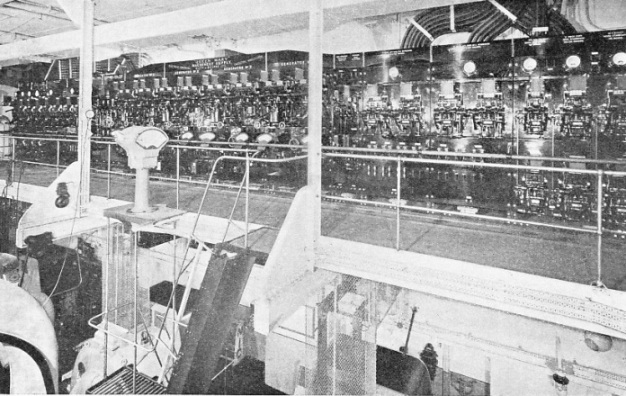 THE MAIN MACHINERY SUPPLY SWITCHBOARD in the engine-room of the Queen Mary is the control point for the supply of electricity. The switchboard is 46 feet long. Leading down from the upper platform are the cage-protected feeders to the turbo-generators on the deck below. There are 735 miles of main insulated cable and 3,000 miles of subsidiary cable in the ship. The story of Erling Tambs, who sailed a 40-feet cutter, the Teddy, from Norway to New Zealand. This chapter, by Sidney Howard, is concluded from part 38. It is the eighth article in the series Great Voyages in Little Ships. 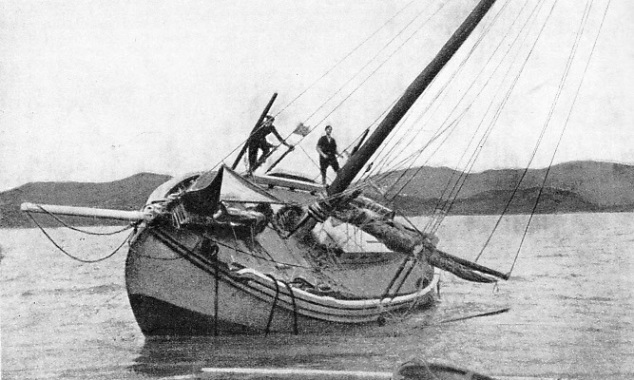 IN THE BAY OF ISLANDS, on the north-east coast of New Zealand, the Teddy was beached for repairs to her rudder. Returning to New Zealand from her triumphant race to Sydney, the Teddy accepted a tow from a scow at Whangaroa. The rope parted and, in returning to pick it up the scow ran into the Teddy’s stern. Later the Teddy’s anchor chain broke and she was blown ashore, but she was pulled off and towed to Auckland. A SOARING MAINMAST 150 FEET HIGH was one of the distinctive features of the Salamis. Captain Holmes, who sailed in her as third mate and painted the original of this illustration, thought “she was the most beautiful thing afloat”. She was an iron ship of 1,130 tons gross, built at Aberdeen in 1875. A striking photograph of the Salamis appears on page 1235. The problem of the transport of troops by sea in naval ships or merchantmen has always involved questions of the greatest difficulty. The work of troopships during the war of 1914-18 solved problems that had never before arisen on so large a scale. Generally, the Government has an arrangement with the shipping companies to charter their ships at an agreed rate. In 1935, for instance, the Bibby Line supplied the Lancashire, Dorsetshire and Somersetshire and the British India Line the Nevasa and Neuralia. Frank Bowen wrote a most interesting chapter on this very specialized subject. AN EX-BRISTOL CHANNEL PILOT CUTTER is one of the finest types of boat for yacht cruising. 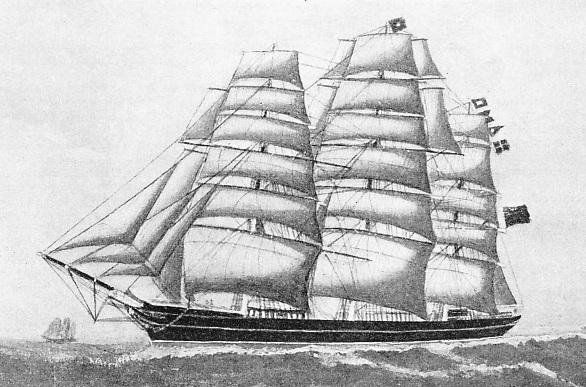 The author of this chapter, F G G Carr, has sailed about 30,000 miles in the Cariad (above), of 26 tons. She was built in 1904 and is a fine sea-boat of a type which, for its size, is scarcely excelled in seaworthiness by any other craft. 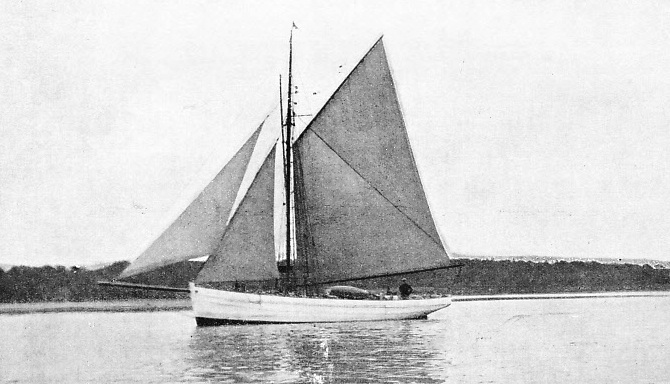 The Cariad features in Frank Carr’s book A Yachtsman’s Log, first published in 1935. AUSTRALIAN TROOPS on board the Demosthenes during the war of 1914-18. 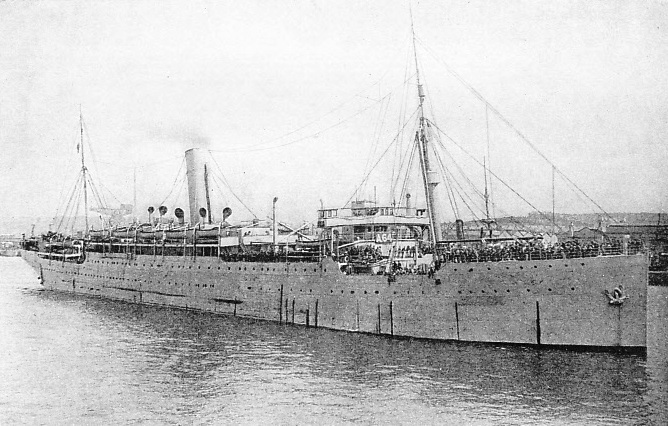 Built in 1911 at Belfast, the Demosthenes had a gross tonnage of 11,223. She was 500 ft 7 in in length between perpendiculars, with a beam of 62 ft 4 in, and a depth of 39 ft 5 in. She belonged to the Aberdeen White Star Line and was one of the numerous liners that acted as troopships during the war. She was broken up in 1931. The fascination of sailing a private yacht in British, or even in foreign waters is no longer the exclusive privilege of the rich man. The author of this chapter, F G G Carr, shows how an amateur should set about yacht cruising in an economical and seamanlike manner. He is an experienced yachtsman, and his chapter is full of sound and practical advice. A photo-feature on the new entrance to Tilbury Dock in the Port of London. 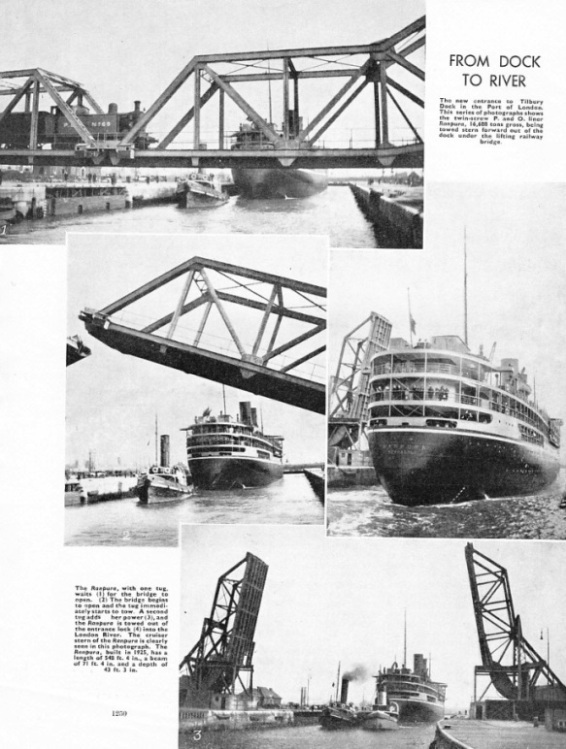 This series of photographs shows the twin-screw P and O liner Ranpura, 16,688 tons gross, being towed stern forward out of the dock under the lifting railway bridge. The Ranpura, with one tug, waits (top) for the bridge to open; (middle left) the bridge begins to open and the tug immediately starts to tow; a second tug adds to her power (bottom); and the Ranpura is towed out of the entrance lock (middle right) into the London River. The cruiser stern of the Ranpura is clearly seen in this photograph. The Ranpura, built in 1925, has a length of 548 ft 4 in, a beam of 71 ft 4 in, and a depth of 43 ft 3 in. The Hyogo Maru, which is illustrated above, is one of the strangest in appearance, for her high ‘midship superstructure is streamlined not only at the forward end but also at the after end. She is easily in the front rank of unorthodox motor ships. Her sister ship is named the Osaka Maru. 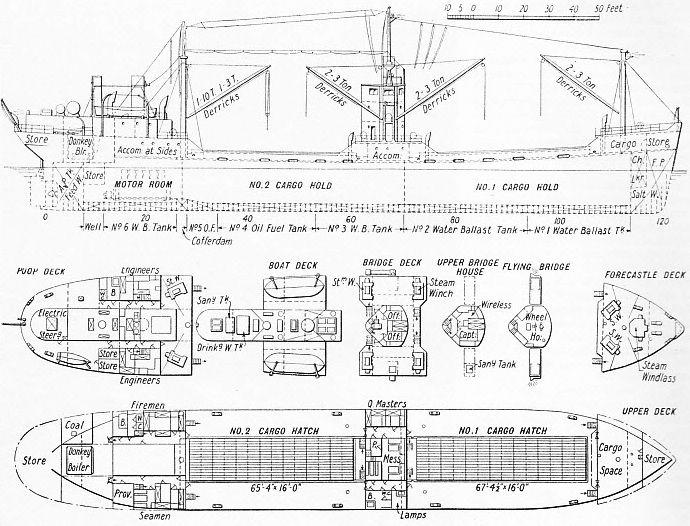 Note the long, clear holds and decks with machinery aft and superstructure reduced to a minimum in the fore-and-aft direction. The Hyogo Maru is 251 ft 8 in length between perpendiculars, with a beam of 37 ft 11 in, and a depth of 18 ft 8 in. Her deadweight tonnage is 2,400 and her gross tonnage 1,472. When fully loaded the vessel has a speed of about 12½ knots, given by a semi-diesel engine with six cylinders, developing a total of 900 bhp. The Hyogu Maru and her sister ship are single-deckers, with forecastle, structure amidships and poop. The forecastle is devoted to a bosun’s store and the cargo space, and there is a clear well deck for No. 1 Cargo Hatch, which is 67 ft 4½ in long and 16 feet wide. After this is a house stretching from side to side of the ship, with dining saloon and pantry amidships, spare room for the quartermasters on the port side, and bathroom and lavatories on the starboard side. The poop is occupied by crew accommodation at the forward end round the engine casing and a large Scotch donkey boiler at the after end. This has its own special funnel. The exhaust from the main diesel goes into a slightly larger funnel forward of the steam funnel. The stern is of normal counter type and the singles crew is in front of a semi-balanced rudder. The derrick-supporting structures amidships - common in Japanese ships - are of lattice type; they are joined together by horizontal thwartship girders, above which is a topmast. There are eight derricks most of three tons capacity, and served by steam winches. Her hatches are of a length to make it possible easily to transport heavy material such as railway rolling stock. This is the twenty-ninth article in the series on Merchant Ship Types. In a ship the size of the Queen Mary the propelling machinery and auxiliary plant attain enormous dimensions, yet so well has she been designed that her space and power are used to the fullest advantage. We cannot all have the privilege of seeing the machinery which propels the Queen Mary. She owed virtually everything to her engines on her record transatlantic crossings. Some people deplore this “machine age”, but I cannot agree with them. To my mind, a big piece of machinery doing a big job of work, and doing it smoothly and without a hitch, is one of the finest works of man. This chapter is by F E Dean, who has already contributed several chapters on various aspects of the marine engine. 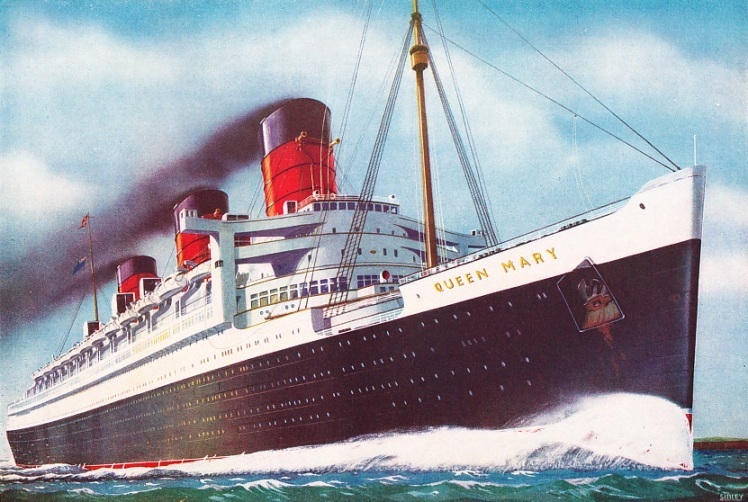 The article is accompanied by a superb colour plate of the Queen Mary. Vivid extracts from the log of the late Captain James William Holmes (1855-1934), who served in famous vessels in the heyday of the sailing ship era. His experiences before he achieved command are related here and illustrated from some of his own paintings. In Frank Bowen’s introductory chapter on the Romance of the Racing Clippers, there was a reference to the late Captain Holmes of the Leucadia. This caught the eye of Captain Holmes’s daughter, Mrs Coughlan, who, as the daughter of a famous clipper ship captain, was naturally attracted by Shipping Wonders of the World. Mrs Coughlan wrote a most interesting letter in which she described some of her father’s experiences. Captain Holmes had a long and varied career at seas and was gifted with a most remarkable memory for ships, persons and places. Also, he was a talented artist and was able to sketch from memory the vessels he had known. Mrs Coughlan was kind enough to put at my disposal all the records, logs and sketch books of her late father and she offered me her assistance in preparing for Shipping Wonders a chapter which should deal with Captain Holmes’s experience during his half century at sea. Naturally, a certain amount of discussion and arrangement followed, which all took time. But the end result of it all is this chapter that vividly portrays the proud days of sail. This chapter has been compiled by Mrs Coughlan from the journal of hr father. It recounts, in Captain Holmes’s own words, his experiences from the time he was apprenticed until he received his first command in 1890. This chapter contains plenty of anecdotes about ships and men of bygone days. It will revive glowing memories among the “shellbacks” of my readers, as well as delighting those who have never sailed in a square-rigged vessel. An added interest is given by the illustrations, some of which are reproduced from Captain Holmes’s own painting. The two most outstanding personalities of their time, Nelson and Napoleon were both supreme strategists. In the engagement in Aboukir Bay, near Alexandria, on August 1, 1798, Nelson’s tactics and his officers’ seamanship frustrated Napoleon’s schemes in a few hours. Most of us have, at some period of our youth, been made to learn a well-known poem which begins “The boy stood on the burning deck”. Some of us remember that the incident referred to happened at the Battle of the Nile. Frank Bowen commented on the proof of this chapter “An account of the battle of the Niles which does not mention Casabianca is as refreshing as it is unusual”. I am sure this criticism will be heartily echoed by readers who appreciate the unsentimental and detached spirit in which Lieut-Com. E Keble Chatterton presents this series. This chapter is the fourth article in the series on Decisive Naval Actions and is concluded in part 40. 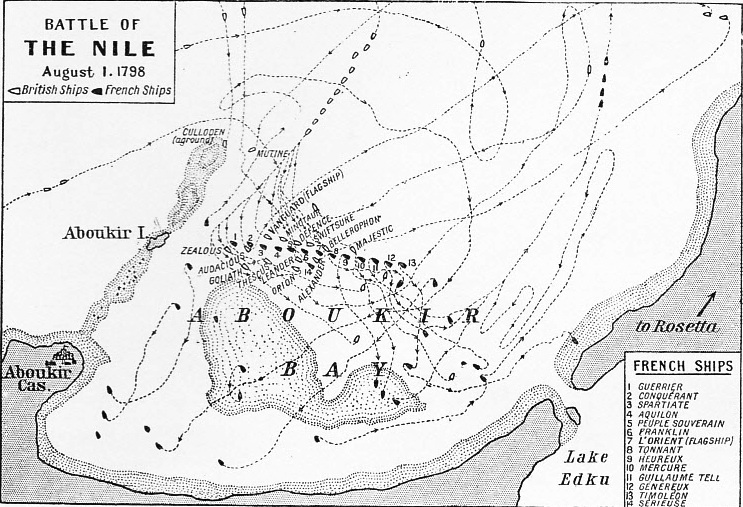 POSITIONS OF THE RIVAL FLEETS at the battle of the Nile are indicated on this diagram. The French ships are shown in black and numbered to correspond with the key inset. The British fleet, shown in white, entered the bay in line ahead. Dotted lines and arrows indicate how they moved up, in shoal-ridden waters, to their positions to port and starboard of the French line. HMS Culloden grounded on a shoal and never joined the battle. THE MIGHTY ATLANTIC RECORD BREAKER. Within little more than three months of her maiden voyage in May 1936, the Queen Mary had broken six Atlantic speed records, and had won the Blue Riband. On August 19, 1936, she left Southampton for New York and covered the distance from Bishop Rock to the Ambrose Light, 2,907 miles, in 4 days 27 minutes, at an average speed of 30.14 knots. She left New York on August 26 and covered the eastbound distance from the Ambrose Light to Bishop Rock, 2,939 miles, in 3 days 23 hours 57 minutes, at an average speed of 30.63 knots. Her speed records include the fastest day’s run eastbound and westbound, the fastest crossing in either direction and the fastest port-to-port times between Cherbourg and Southampton and vice versa. The illustration is by K M Sibley.